One of the more anticipated products to launch today is Cascade Lake AP. 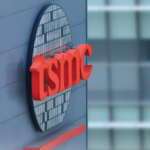 Those processors are designed to the have the absolute highest performance and highest memory bandwidth per socket, albeit at the cost of very high TDP. To that end, Intel is launching four advanced performance models. For the 56-core part, there is the full 77 MiB of L3 cache available. 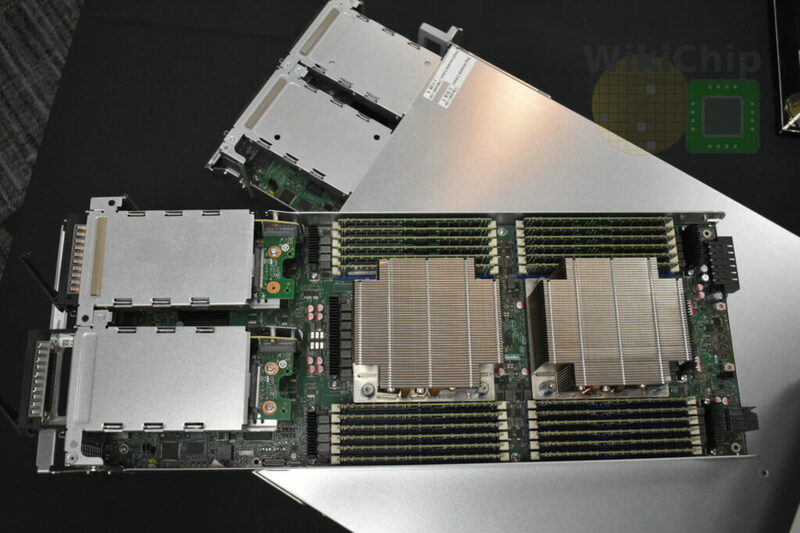 For all the lower-count SKUs (48 and 32-core parts) the L3 cache is equivalent to that of a 52-core model. 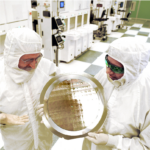 Cascade Lake AP processors comprise two extreme core count dies on a single BGA package. When Intel first announced those processors, we speculated that if Intel intends on supporting two-way SMP, the way Intel will connect the four dies together is by connecting one UPI link to every other die. 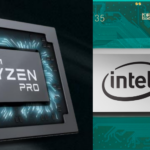 This is, in fact, how the new Platinum 9200 processors are connected. 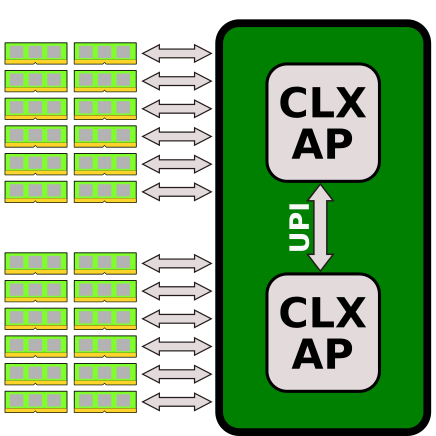 This configuration results in an all-to-all connection yielding very deterministic latency which is something Intel favors. 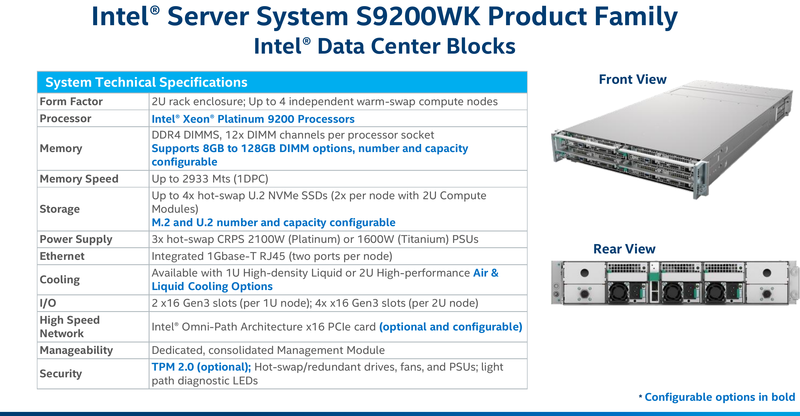 All Platinum 9200 processors support twelve channels of DDR4 memory operating at 2933 MT/, support 2-way SMP and expose 40 PCIe lanes. 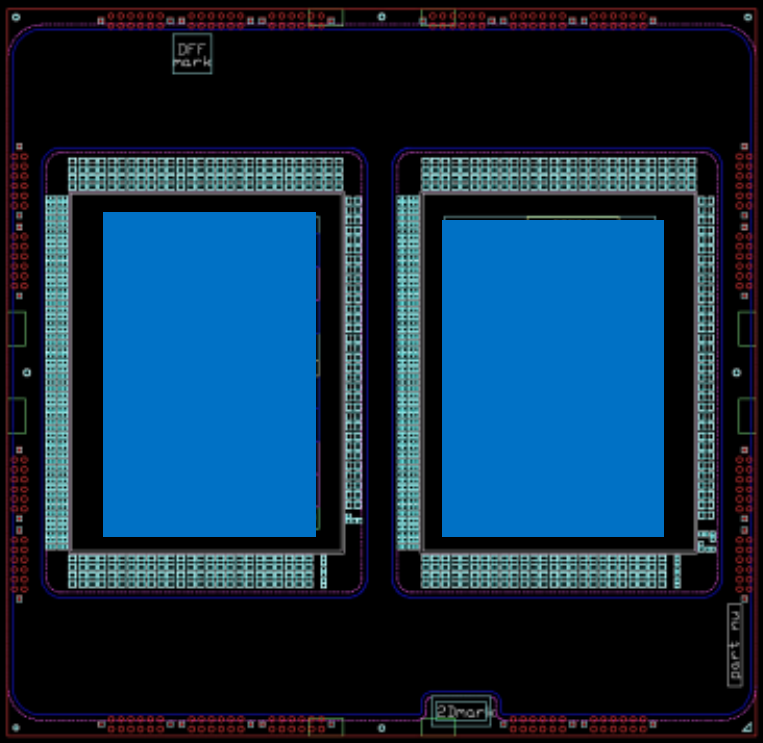 Those processors are packaged in a 5903-ball BGA package with a 0.99mm pitch. There are 2 separate power corridors for better distribution, allowing higher performance. Intel says that the package is designed such that a single heat spreader can support the full TDP for all SKUs. One of the major selling points for the Platinum 9200 processors is the twelve DDR4 memory channels it offers. 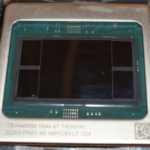 Intel claims those processors provide the most native DDR4 memory channels than any other CPU. 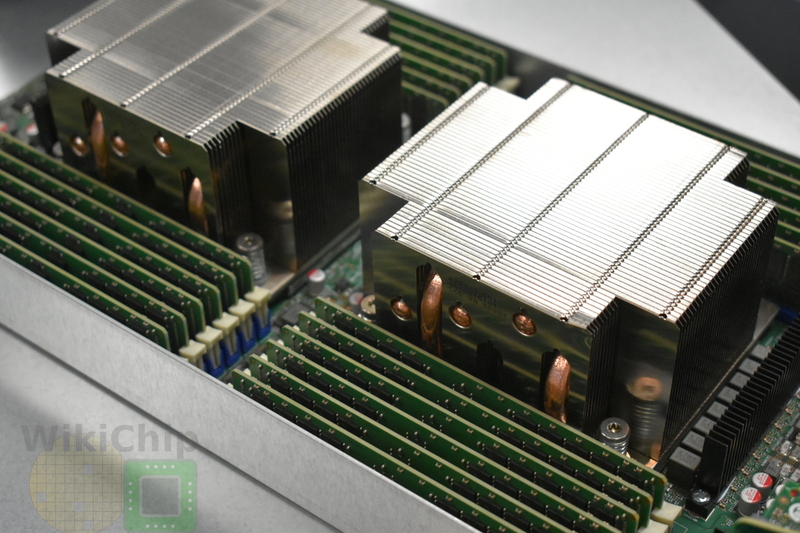 As a side note, NEC’s SX-Ace vector processor had the highest number of memory channels – 16, albeit those were DDR3 and operated at only 2000 MT/s. 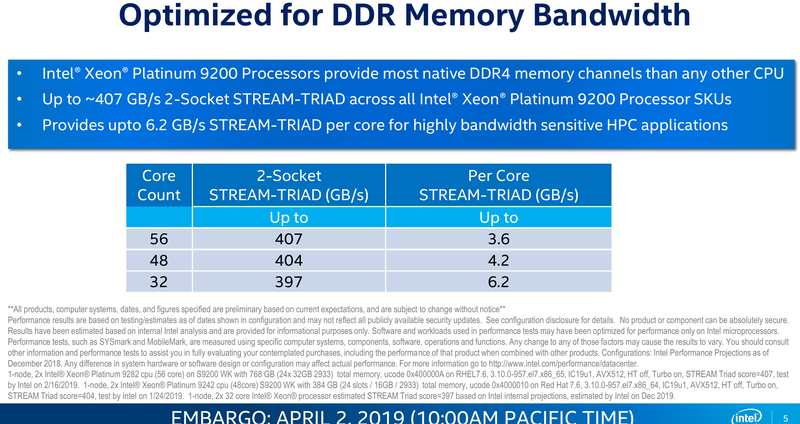 For the 9200 series, Intel is reporting up to ~407 GB/s 2-Socket STREAM-TRIAD across all SKUs and up to 6.2 GB/s STREAM-TRIAD per core for highly bandwidth sensitive HPC applications. 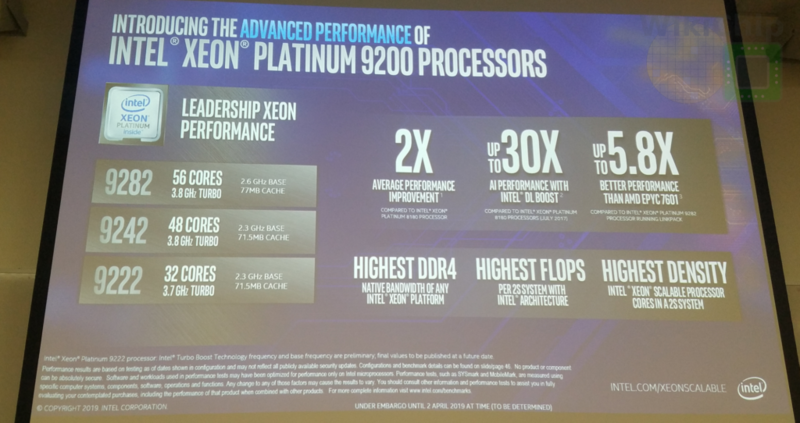 One of the interesting differences between the Platinum 9200 and the rest of the Xeon Scalable lineup is that those new processors, which are soldered to the motherboard, only come in Intel’s S9200WK boards. In many ways, they are Intel’s equivalent of Nvidia’s DGX. Modules are always 2S and they come with either high-velocity air-cooling or direct-to-chip liquid-cooling via cold-plates. 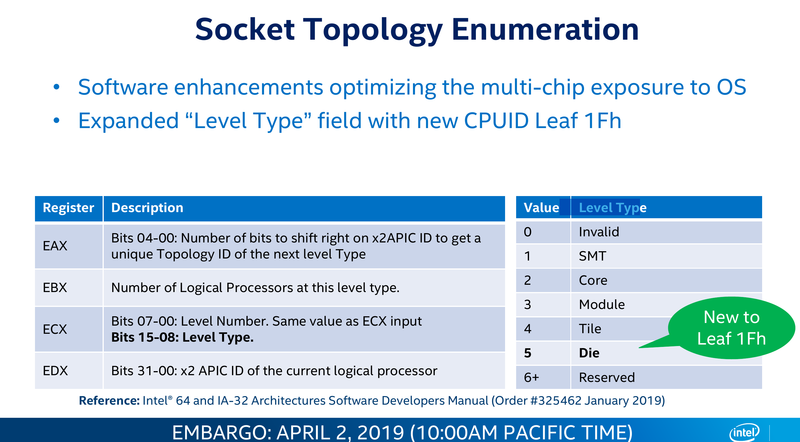 Since AP processors incorporate multiple dies on the same package, Intel added a new “Die” level type in order to expose this information to the OS. The new level has been added to the standard CPUID EAX=1Fh.